This example project detects a button press to enable and disable a blinking LED. A push button switch on the evaluation board is connected to an I/O Port pin on the PIC32. Two Timer System Service objects are used in this project. One creates a delay (100 ms) used to poll the I/O Port pin connected to the switch. The other creates a delay (50 ms) used to debounce the switch and blink the LED. The Timer System Service object used to poll the switch is always active. The Timer System Service object used to blink the LED and debounce the switch only exists when switch debouncing and LED blinking is needed. This provides an example of how a delay (and its corresponding resources) can be created and deleted during run time. The contents of the following .zip file need to be placed in this directory. If this is not done, the MPLAB® X IDE will not be able to find all source files, and the project will not build successfully. You will use the Timer System Service to implement two delay periods. One will blink the LED and debounce the switch every 50 ms, and one will poll the switch every 100 ms. Check the box beside "Use Timer System Service?" Check the box beside "Interrupt Notification Enabled"
The "Internal Time Units (Hz)" controls the decrement rate for the alarm delay period countdown timers (10 000 Hz = 10 decrements per 1 ms). 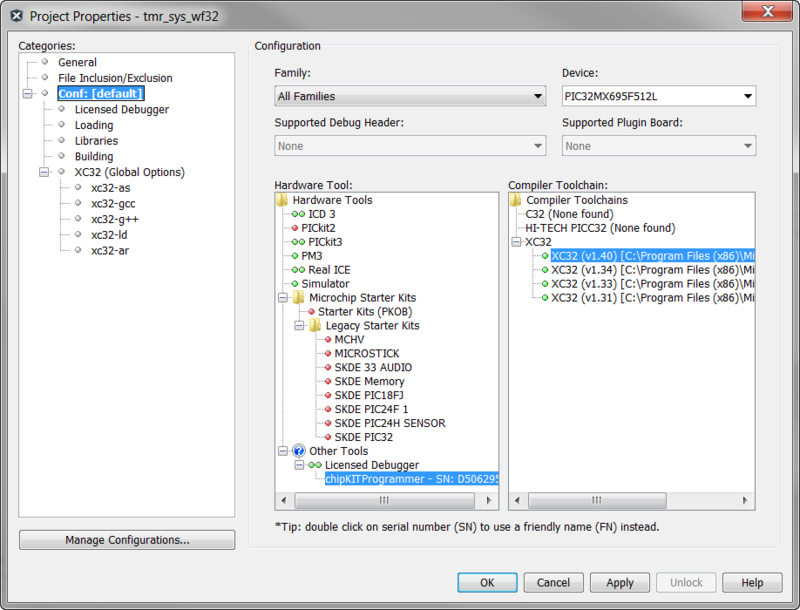 Note how the MHC configuration tree is highlighted to show a change from MHC's default value. The Timer System Service Library is a client for the Timer Driver Library. Checking the "Use Timer System Service?" box will also automatically check the "Use Timer Driver?" box (found in: Harmony Framework Configuration > Drivers > Timer) for you. This is MHC's default setting when the Timer System Service is enabled, so this change is not highlighted. You will also use the default settings for the Timer Driver (uses the Timer1 peripheral), so there is no need to configure it. You could have defined these in the application header file (app.h), but defining them in the system configuration header file (system_config.h) allows these macros to change if you plan on using different hardware platforms. The MPLAB X IDE allows one project to support multiple hardware platforms through the ability to include or exclude source files from the project based on the project configuration. 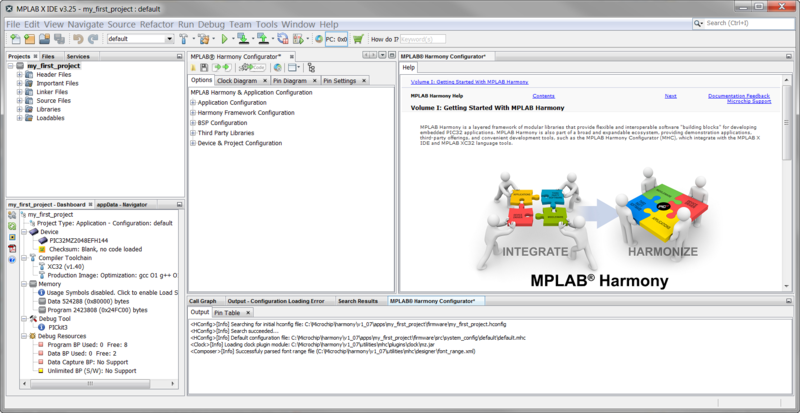 The MPLAB Harmony Framework uses this ability to include all source files in one system_config folder, while excluding all others (if others exist). Create the callback functions used by the Timer System Service. You enabled and configured the Timer System Service in a previous step. When you clicked on MHC's "Generate Code" button, it included the appropriate Timer System Service source files in your project, and added code to initialize and configure it per the settings you provided in MHC. One to debounce the switch and blink the LEDs every 50 ms. In this step, you will create the functions associated with these delay periods. Open the app.c file (found in the Source Files ▶ app ▶ folder), and add the following callback function to poll the switch (near line #93). If the state machine is in a blinking state, the LED will be turned on and shut off every 50 ms. If a switch press or switch release is detected, it will debounce the switch. Read the value on the I/O Port pin. If the correct voltage corresponding to a pressed (or released) switch is read, increment the debounce counter. If two consecutive correct voltage readings occur (determined by APP_DEBOUNCE_COUNT), the voltage on the pin has stabilized. Set the flag indicating the switch press (or release) has been confirmed (appData.switchHasBeenPressed = true or false). Depending on the circuit connected to the I/O Port pin, a switch press will put either a 1 or a 0 on the pin. The callback function will work for both cases as long as you properly declare the value of APP_CN_PRESS_EQUALS_1_OR_0 (declared in system_config.h in a previous step). 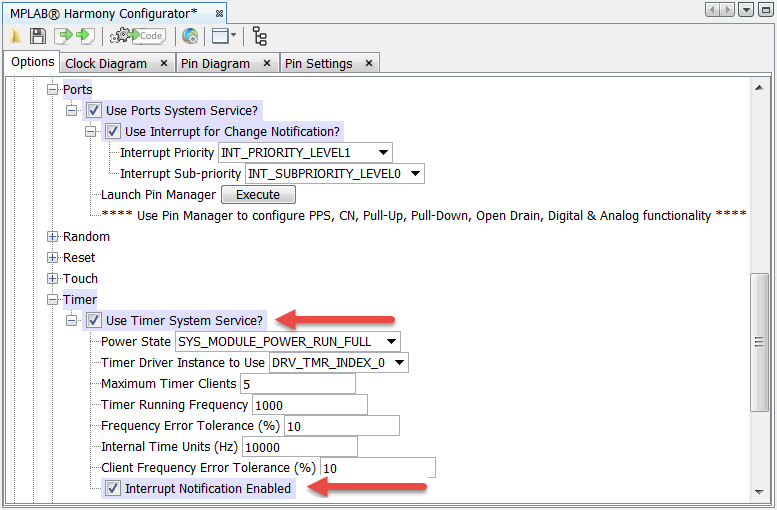 Create two delays using the Timer System Service (one 50 ms and one 100 ms). APP_STATE_INIT This state initializes appData.pressDetected and appData.switchHasBeenPressed to true, and transitions to the APP_STATE_LED_OFF_NO_PRESS_DETECT state. These variable settings in this state force the state machine into the APP_STATE_BLINK_LED_NO_PRESS_DETECT state to blink the LEDs. APP_STATE_LED_OFF_NO_PRESS_DETECT In this state, the LED is off. The APP_TimerCallBack1() function tests for a switch press every 100 ms. When it detects a switch press, the pressDetected flag is set. This causes a new Timer System Service to be created with a 50 ms delay. This delay is needed to debounce the switch and to create the LED on and off times so you can see it blink. SYS_TMR_ObjectCreate() passes the delay time in ms (defined by APP_LED_BLINK_DELAY) into the function. It also passes the name of the callback function (APP_TimerCallBack2()) to run when this time has passed. A pointer (handle) to this new System Timer object is returned by the function so we can access it later. After the System Timer object is successfully created, it will transition to the next state: APP_STATE_LED_OFF_DEBOUNCE_PRESS. APP_STATE_LED_OFF_DEBOUNCE_PRESS This state keeps the LEDs off while it waits for a switch press to be confirmed (waits for the switch debounce to complete). This happens when appData.switchIsPressed is set to true. When the press is confirmed, it transitions to APP_STATE_BLINK_LED_DEBOUNCE_RELEASE. APP_STATE_BLINK_LED_DEBOUNCE_RELEASE Now that the switch is confirmed as pressed, the LED will start to blink. Before you can detect another press, you must first confirm a switch release (no press). When the state machine is in this state, the APP_TimerCallback2() function will debounce the press release. When the release is confirmed, the switchIsPressed flag will be cleared. This causes the state machine to advance to the APP_STATE_BLINK_LED_NO_PRESS_DETECT state. APP_STATE_BLINK_LED_NO_PRESS_DETECT This state blinks the LED while waiting for a press to be detected. The APP_TimerCallback1() function polls the switch every 100 ms. 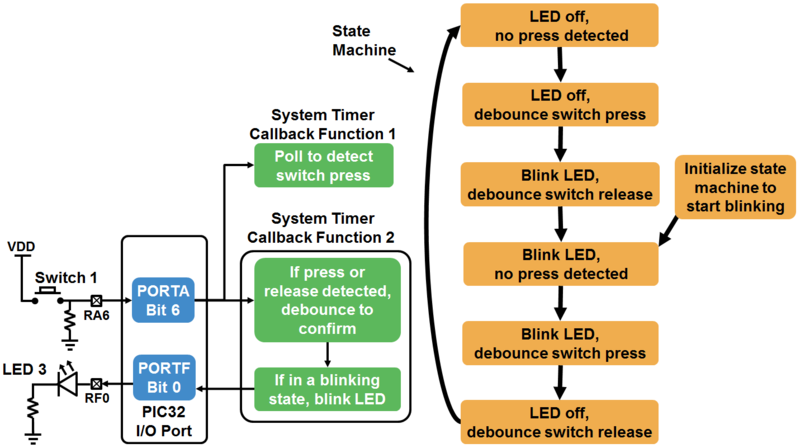 If it detects a switch press, it will set the pressDetected flag, causing the state machine to advance to the APP_STATE_BLINK_LED_DEBOUNCE_PRESS state. APP_STATE_BLINK_LED_DEBOUNCE_PRESS This state keeps the LED blinking until a switch press is confirmed. Once a press is confirmed, it will shut the LED off, and transition to the APP_STATE_LED_OFF_DEBOUNCE_RELEASE state. APP_STATE_LED_OFF_DEBOUNCE_RELEASE In this state, the LEDs are off, and the switch release has to be confirmed. The APP_TimerCallback2() function will debounce the press release and clear the switchIsPressed flag. When this happens, this System Timer Object to blink the LED and debounce the switch is no longer needed, so we can delete it. There is no switch press detected, so you don't need to debounce the switch, and the LED isn't blinking, so you don't need the delay between LED on and off. You don't have to delete this, but it will conserve system resources of you do. After deleting the System Timer Object and initializing the pressDetected flag to false, the state machine transitions to the APP_STATE_LED_OFF_NO_PRESS_DETECT state. 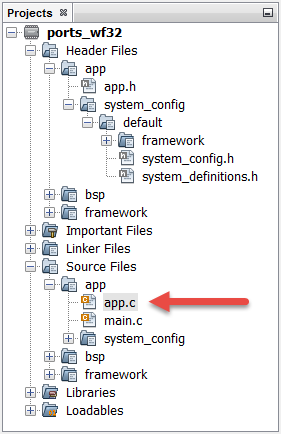 Open the app.c file and add the following code to the application state machine in APP_Tasks (near line #283). 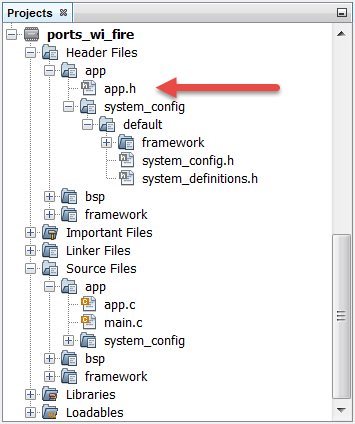 Remember to comment out references to the existing APP_STATE_SERVICE_TASKS state as shown below. MHC has generated this example state for you, but you won't use it. After successfully programming the device, the LED will start blinking. Press Switch 1 (labeled BTN2) on the board to stop the blinking. Press it again to restart the blinking. 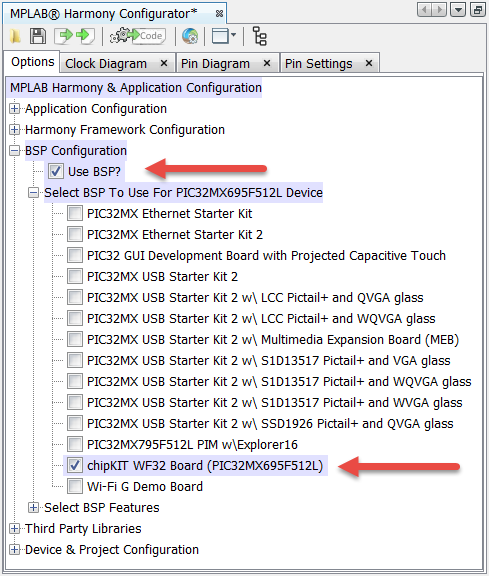 This example project demonstrates much more than configuring, monitoring, and controlling PIC32 I/O Port pins. 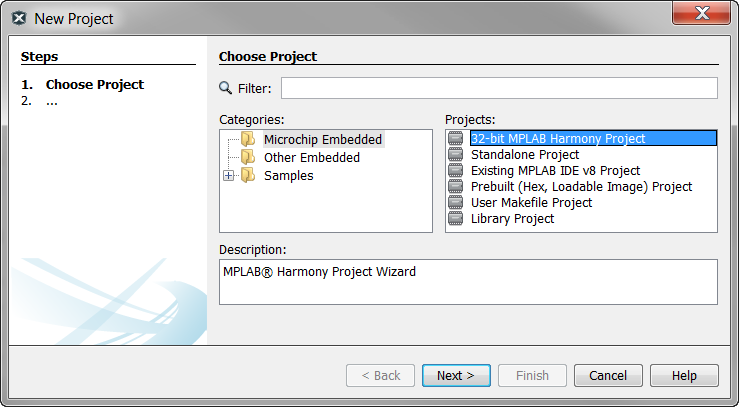 You've also learned the basic program architecture common to all MPLAB Harmony projects. You may be thinking that this a lot of code to monitor a switch and blink an LED. This is true. 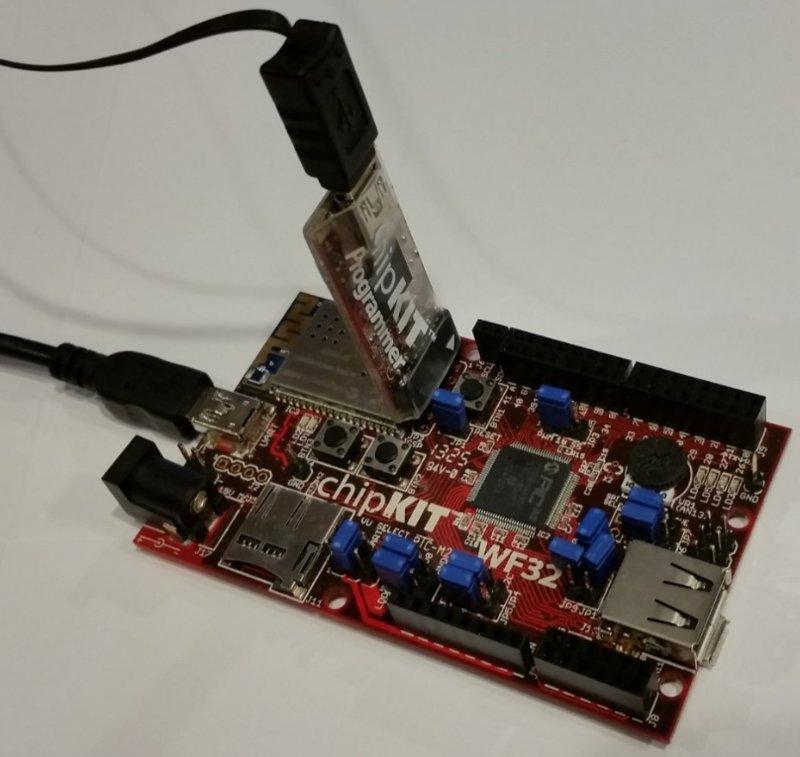 An 8-bit device can perform this task for less cost and less code. The assumption is you will want to integrate this code into a larger project that may already implement the Timer System Service (e.g. the Harmony TCP/IP stack). This code will work cooperatively with other Harmony library modules, and it will efficiently share PIC32 resources. It can also be easily reused in other PIC32 projects, and frees you from needing to learn details of how the underlying hardware works.